Maybe you’ve been too busy at work. Maybe you forgot to change your calendar and have been thinking it’s September for six weeks. Whatever the reason, you realize it’s almost Halloween and you don’t have a costume for you or your kids! 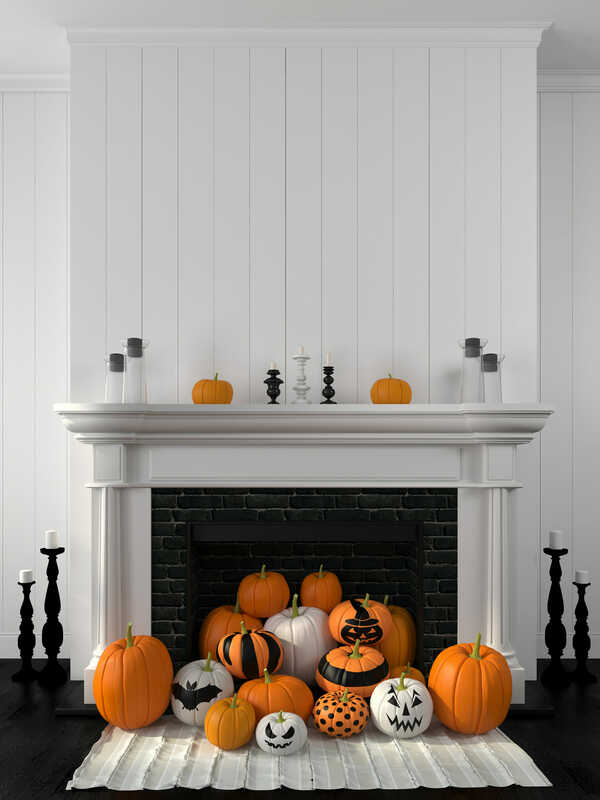 Our Halloween motto is “don’t agonize—accessorize!” Just add a few elements to some items you probably already have lying around your house, and boom: a first-rate costume in no time. Since everyday is kids’ day, we’re going to start with the grownups first. Here are some great ideas for the young at heart. Here’s a pun costume that guarantees you’ll get to look awesome all night. Get an old slip, pin on some textbook psychology words, and go as a Freudian slip. Or, if your slip is the appropriate shade of rose, write the words “You’re Fired!” on it, and go as a pink slip. 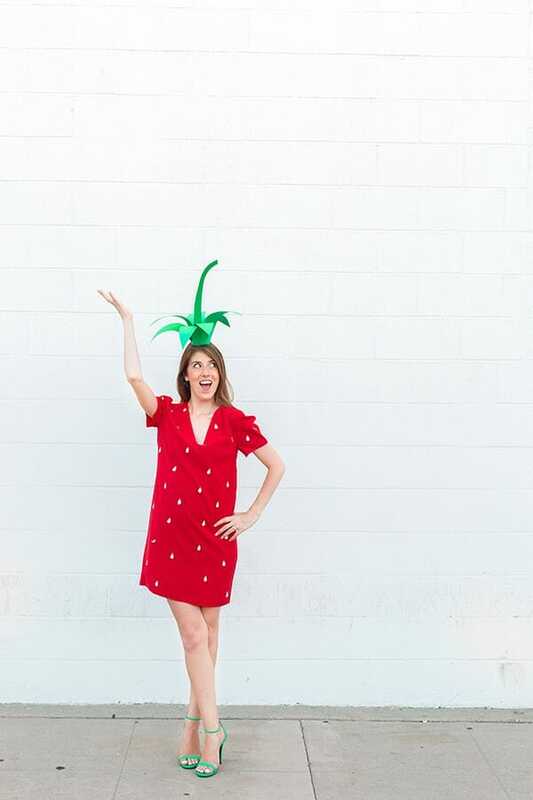 If you’ve got a cute red dress lying around, you can easily whip up this adorable strawberry costume that’s half British mod and half Carmen Miranda. If red’s not your color, the same technique can easily be used on a yellow dress—and just like that, you’re a pineapple! Only you will know that you churned it out in a mere hour. Remember that bridesmaid dress that your friend made you buy for her wedding? Decorate it with a sash and a tiara, and finally become a beauty pageant winner! Now it’s your special day. Or, if your tastes tend towards the ghoulish, douse yourself with fake blood and crown yourself Miss Hades. You say puns are more your style? Hang a note around your neck that says “Sorry” and go as a formal apology. Got two friends who also waited until the last minute? Have you all got sweatsuits (or matching yoga pants and sweatshirts) and sunglasses? How about going as the three blind mice? Or, if you’re going solo this season, how about this darling deer costume? If you’re willing to make a last-minute dash to the crafts store, you can put together this cute little tree get-up using only some felt and some decorative plants. As a bonus, you get to wear your warmest sweater dress and cute boots all night! 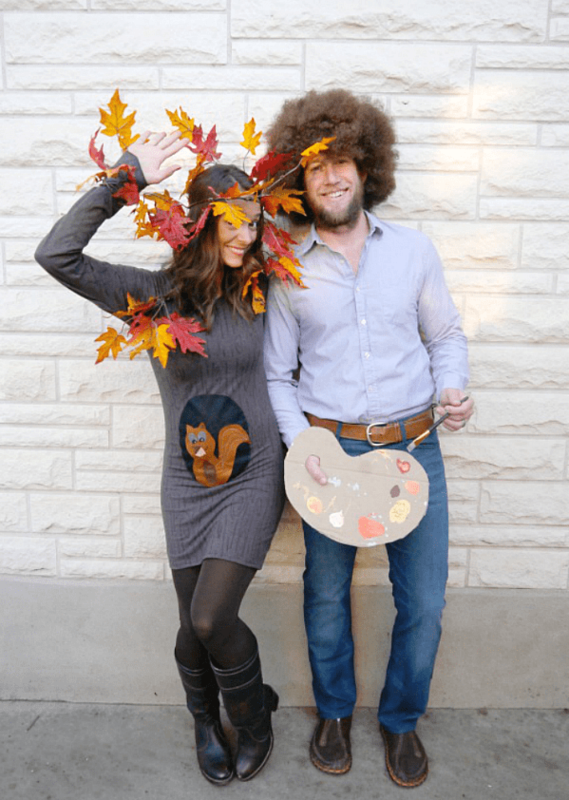 We think this ensemble looks great, with or without a Bob Ross. And now, the kid’s table. Just because you’re a busy parent doesn’t mean that your kiddo has to wear last year’s ill-fitting costume over again. Here are some cute ideas that you can make using things you may already have in your house. Hoodies are the stuff that last minute DIY costumes are made of. From the cuddliest lion or shark to Dr. Seuss’s Thing 1 and Thing 2 there’s tons of hoodie-inspired ideas! 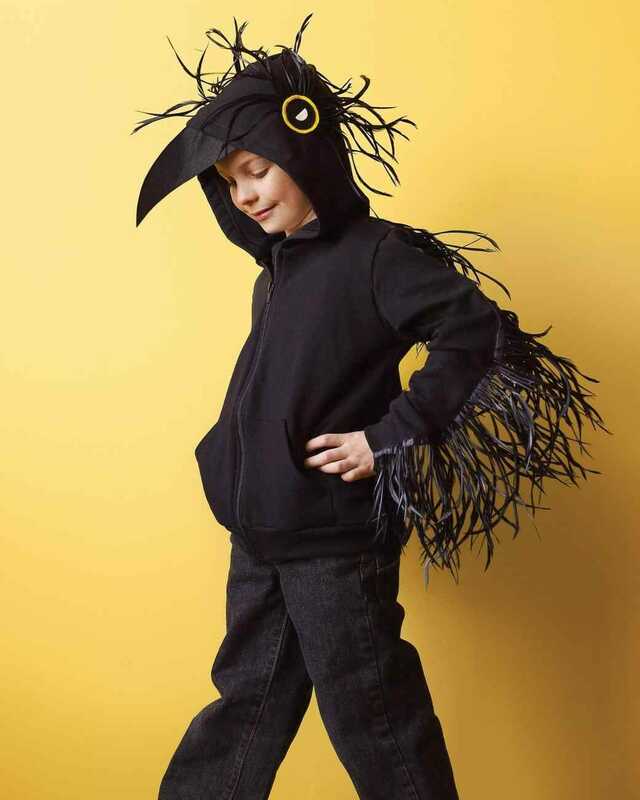 We particularly love this artistic raven costume, perfect for your budding poet or ornithologist. There’s a reason that duct tape acolytes believe you can use it for anything. It really is versatile! 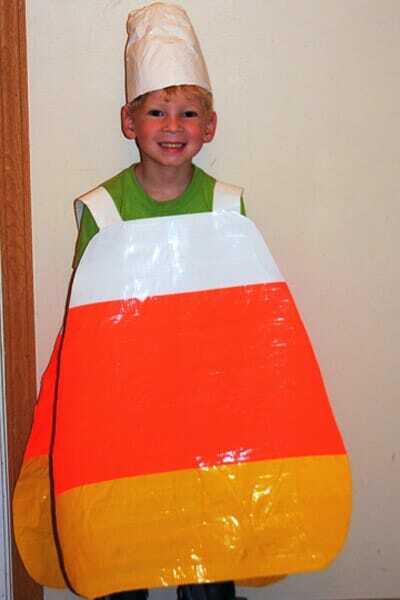 And tonight, it’s going to be all you need to create a quick, clever candy corn costume for your little one. You get to craft and the kiddo gets a costume. Win-win! Give an Umbrella New Life…As a Bat! Some of us moms are just never going to be seamstresses. Most of the year, this is fine, but come Halloween, you start looking at all the cute DIY costumes out there and feeling a little inadequate. Well, never you mind. 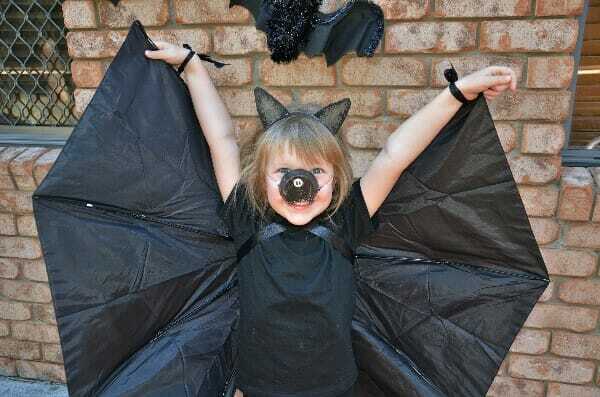 Trick your crafty friends into thinking you rock the sewing machine by making this cute umbrella-wing bat costume—no sewing required! As a bonus, it’s a great way to reuse that broken umbrella you never threw away. 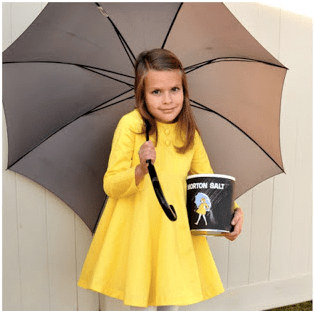 Speaking of umbrellas, check out this adorable Morton Salt Girl costume. No need to go to all the trouble of sewing a new dress if you haven’t got time. A yellow raincoat or girl’s dress will do the trick just as well. This one is super unique and oh-so-easy! All you need is a box, some colored construction paper, and some black paint! 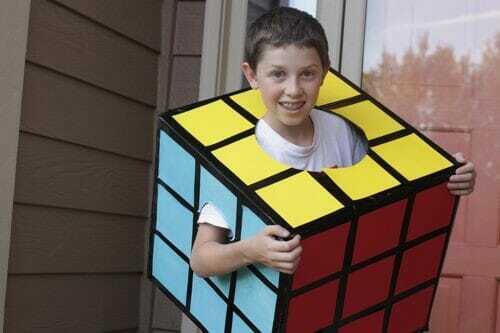 We love how quirky and quick this Rubik’s Cube costume is, and it’s great for those of us on a budget! Consider your Halloween costume problems solved! With one of these painless costume options, you and your kids can have an All Hallow’s Eve that’s all fun and no fright! Happy Halloween!